The black belt club training program is comprised of students committed to the goal of Black Belt. Black Belt Club Karate Classes represent the inner core of our school and best represent what American Academy of Self Defense stands for. 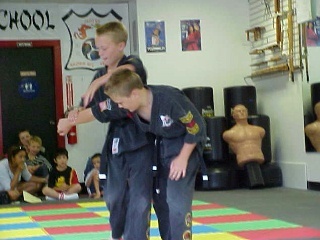 To qualify, a student must be an orange belt or above and have their instructor’s approval. 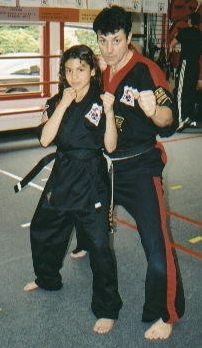 Age or technique is not a requirment for the Black Belt Club; attitude and attendance are the primary qualifiers. Have recommendation from the Chief Instructor. Have set the goal of Black Belt. Commit to regular class training plus individual practice. Have a winning attitude in karate, school, and at home. Have a high level of enthusiasm and respect for other students. Be current with tuition payments. For students in school: have a good report card on conduct and attitude from parents and teachers. Have good attendance and eagerness to make up absences. Tuition rate guaranteed through Black Belt Membership (3 years) with no annual increases. Special weekly seminar/workout for Black Belt Club plus periodic special events. Permission to wear red uniform pants of the Black Belt Club. Opportunity to participate in leadership and special teams.